To be completed by doctor. To reduce time between Doctor's verbal Telephone orders for medications and written confirmation of that order. To ensure Resident's Medication Chart remains at the facility. To confirm order received by phone. After Resident's visit to Doctor's surgery. Upon Resident's discharge from Hospital. After Pathology results received by Doctor. 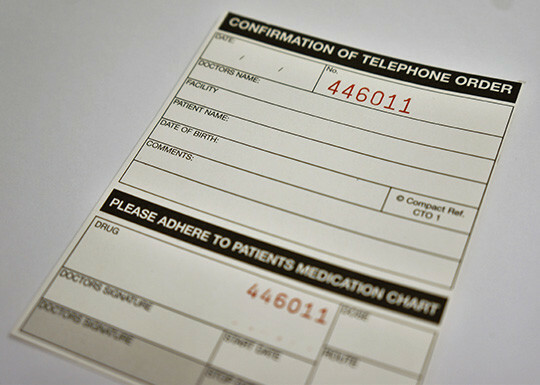 While giving the nurse a medication order via the telephone, the Doctor advises the label number which the nurse records in the "verbal order" section on the Medication Chart. After completing the label, the Doctor forwards it by post or via the Chemist, with the script to the facility. Check the telephone order label number against the verbal order previously received. Administration should be now recorded against the order in the normal way. Term or PRN section of the medication chart. The verbal telephone order can now have a line placed through it to cease administration. The top section of the label can be adhered to a page in the Doctor's notes or Resident's file.